There is no national registration of companies in the USA. All businesses are registered at the county or state level. Listed below is how to register in California. The state or counties will not check (or care) if your name conflicts with names of other businesses in other states! Sole Proprietorships and private partnerships are registered at the County level in California. This includes Fictitious Business Name statements (also known as “DBA”s). In most cases the fee is under $50 and anyone can register a business simply by visiting your county’s business office and completing the right paperwork. Many of the counties now even have the forms online. For example, in Santa Clara county, visit www.clerkrecorder.org. These registrations are geared for small local businesses. Your business name has to be unique within your County for it to be approved. However, there is no checking from one county to the next. Trademarks: California does support its own trademarks, and even claims to have one of the biggest state trademark databases. However, it is trivial when compared with the federal trademark database. Also there is no way to designate a California only trademark, and most trademark professionals will advise you to use a California trademark only if you cannot get a federal registration and you will specifically only be trading in California. Save yourself time and money by having a full Federal trademark search done first through a naming agency (like this one in this site) or through a low cost online legal service. If your trademark application is rejected you will lose your filing fee. Sales Tax: In California, sales tax varies by county. If you will be selling taxable good or services (which is often the case unless you only sell to resellers), you will need a tax id from the state franchise tax board. They have offices in all major cities. 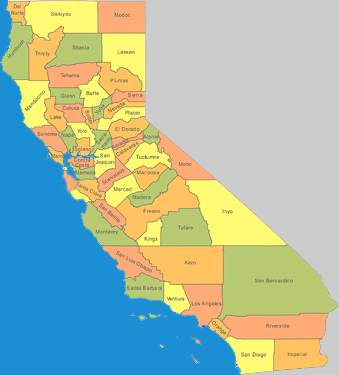 Largest Cities: Los Angeles, San Diego, San Jose, San Francisco, Long Beach, Fresno, Sacramento, Oakland, Santa Ana, Anaheim, Pasadena, Monterey, Fremont, Santa Clara, Palo Alto, Mountain View, Sunnyvale, South San Francisco, San Bruno, Hillsdale, San Mateo, Burlingame, Redwood City, Foster City, Belmont, Half Moon Bay, Santa Cruz, Aptos, San Clemente, San Dimas, Redding, Napa, Marin, Sausalito, Santa Monica, Hollywood, Bel Air, Riverside, Palm Springs, Thousand Oaks, Beverly Hills and Orange County. California is named after the Greek Goddess Califia and is known as The Golden State. San Francisco’s football team is called the 49’ers after the Northern California gold rush of 1849. Oakland’s basketball team is known as The Golden State Warriors.